The Liberal Lady Redskins advance to the championship game of the Salina invitational tournament with a 47-41 win over Abilene. 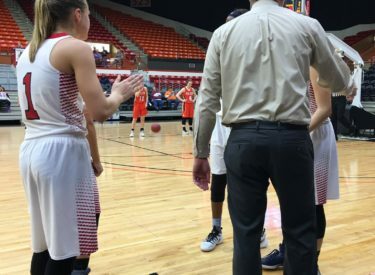 Liberal fought back to beat Abilene Friday afternoon in the Salina Bicentennial center. They trailed by six in the fourth quarter. Liberal plays in the championship game Saturday evening. Liberal bolted to an 11-4 lead and led 11-9 after one quarter but trailed 19-17 at halftime. The Cowgirls, who defeated LHS the past two seasons, led 29-25 after three. Abilene led 31-25 before LHS jumped ahead 42-35 with 48 seconds left. LHS buried four of their past five three’s. Katie Horyna and Jada Michener scored 11 a piece and Machia Mullens had 10. Liberal is 10-1 and Abilene is 7-3. The Lady Red plays in the SIT championship game Saturday at 5:30 on 1270 and kscbnews.net against Salina Central.